My current business practice is for the use of an electronic trading journal spreadsheet, plus hardcopy printouts of charts. 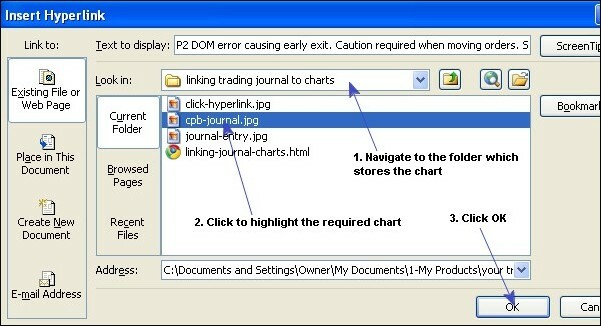 For those though who prefer to operate all electronic, saving on folder after folder of hardcopy printouts cluttering your trading office, the following is a simple Excel trick to allow you to easily find the chart image associated with each trade (within seconds), allowing for easier review at a later date & time. It involves creating a hyperlink within your journal spreadsheet which links to your saved chart image. Most people associate hyperlinks with a link to a webpage. They can also link to files on your hard-drive, as we’ll see in this case. Following the trade, save an image of your chart to your charts folder on your hard-drive. Later, when time allows, annotate notes on the chart. Your charting platform may allow easy addition of notes. If not, there are many image editors available on the market. Navigate to the folder where you’ve saved the chart. Click to highlight the appropriate chart image. Click OK. The journal comments field will now be a hyperlink. 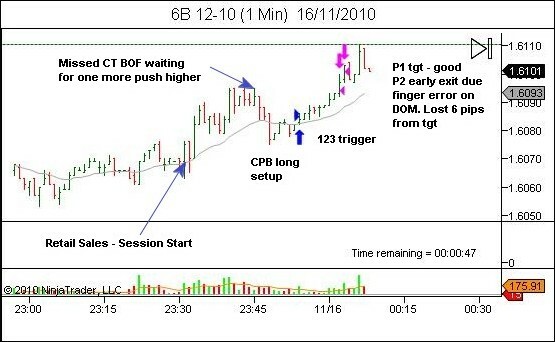 Clicking the link opens up the chart image in your browser window, allowing for easy reference to the chart while reviewing your trading journal entries.